Click here to view our Hurricane Resistant Product Selector. 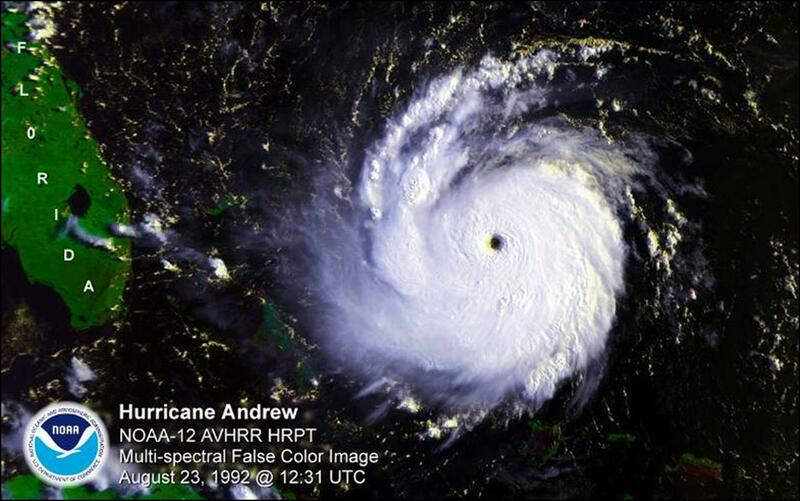 In 1992 hurricane Andrew hit Florida and caused an estimated $25 billion dollars in damages. This became a wake up call for the construction industry. Wind zone levels were not adequate, the existing standards were not being adhered to, and codes were not being enforced. 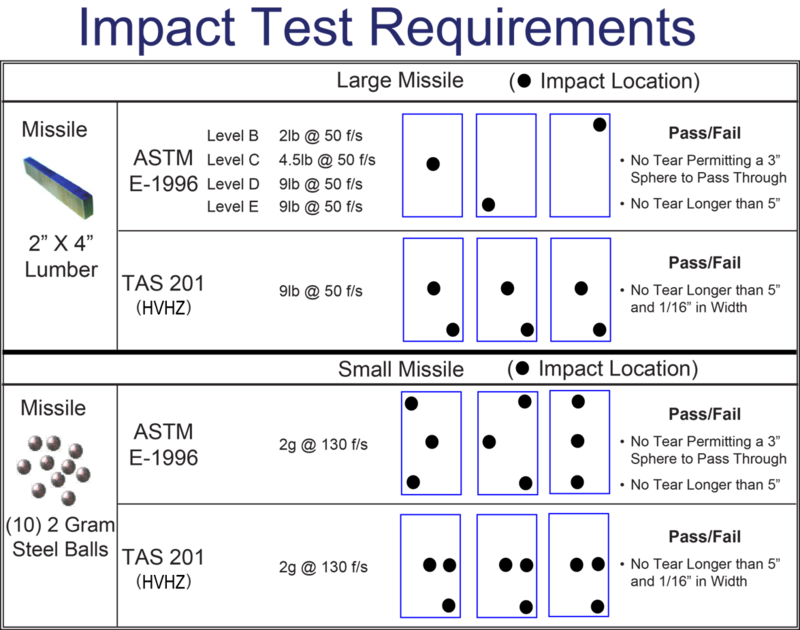 As a result missile impact test standards were developed and more stringent building codes have been put in place that are now enforced. The devastation caused by Andrew was over a very narrow region of South Florida due to the compact size of the storm. However, that narrow path of devastation carved by Andrew was tremendous and deadly. There was a total of 65 deaths attributed to the storm while around 150,000 to 250,000 people in South Florida were left homeless. There was a total of approximately 600,000 homes and businesses that were destroyed or severely impaired by the winds, waves, and rain from Andrew. In Homestead, Florida, the ground zero of Andrew’s landfall on August 24, 1992, almost all the mobile homes were destroyed. Meanwhile, approximately a half billion dollars in damage was caused to many of the boats in the affected area of South Florida. Much of South Florida’s communications and transportation infrastructures were significantly impaired while there was tremendous loss of power and utilities, water, and other essentials while sewage treatment plants were terribly crippled. There were a total of about 1.4 million customers that were left without power after the storm. Residents were without power for up to six months after the storm rolled through. Andrew also caused a great deal of damage to offshore oil facilities as it approached a second landfall in Louisiana, where it caused another $1 billion dollars in damage. In total, the damage caused by Andrew in both South Florida and Louisiana totaled $26 billion dollars, the most costly natural disaster in United States history. The social impacts on South Florida were tremendous. You have to take into consideration that before Hurricane Andrew, there was about a generation of South Florida residents who had not experienced a hurricane. In addition, there were even more residents that had just relocated to the area, and had never experienced any kind of tropical storm or hurricane. That coupled with the death and destruction caused by the storm was a very traumatic experience for these residents. Many decided to move away to a safer region of the country while others decided to stay and try to rebuild their homes and businesses. This process took years to complete. One positive thing that emerged out of this was the fact that Andrew raised tremendous awareness about hurricanes, and forced many Floridians to take precautions well before a storm made a bid for the coast. Not to say that Florida’s preparedness wasn’t good. As a matter of fact, if it wasn’t for the combined efforts of emergency management personnel as well as good hurricane preparedness and evacuation programs, there might have been an even greater loss of life. South Florida continues to improve their preparedness standards by revised building codes that were a glaring problem in the wake of Hurricane Andrew. The building code standards in South Florida are now the toughest in the nation. Tropical storms and Hurricanes are formed from tropical disturbances that travel across the Atlantic ocean toward the U.S. coast line. •Tropical Disturbance: An area of organized convection, originating in the tropics that maintains its identify for 24 hours or more. It is often the first developmental stage of any tropical depression, tropical storm or hurricane. •Tropical Storm: A severe storm that develops offshore over tropical seas. When wind speeds reach 39 mph, the tropical disturbance becomes a tropical storm and is given an official name. •Hurricane: When a tropical storm takes a cyclonic form and has reached a constant wind speed of 74 mph or more. The eye of the storm is usually 20 – 30 miles wide and can extend over 400 miles. Strong hurricane windows can inflict moderate to severe damage to buildings and may cause flooding in coastal areas. We have all heard of “Category 5” hurricane. The Saffir-Simpson Scale ranks hurricanes based on sustained wind speeds and damage caused. 119-153/74-95 Very dangerous winds will produce some damage. Well-constructed frame homes could have damage to roof, shingles, vinyl siding and gutters. Large branches of trees will snap and shallowly rooted trees may be toppled. Extensive damage to power lines and poles likely will result in power outages that could last a few to several days. 154-177/96-110 Extremely dangerous winds will cause extensive damage. Well-constructed frame homes could sustain major roof and siding damage. Many shallowly rooted trees will be snapped or uprooted and block numerous roads. Near-total power loss is expected with outages that could last from several days to weeks. 178-208/111-129 Devastating damage will occur. Well-built framed homes may incur major damage or removal of roof decking and gable ends. Many trees will be snapped or uprooted, blocking numerous roads. Electricity and water will be unavailable for several days to weeks after the storm passes. 209-251/130-156 Catastrophic damage will occur. Well-built framed homes can sustain severe damage with loss of most of the roof structure and/or some exterior walls. Most trees will be snapped or uprooted and power poles downed. Fallen trees and power poles will isolate residential areas. Power outages will last weeks to possibly months. Most of the area will be uninhabitable for weeks or months. 252+/157+ Catastrophic damage will occur. A high percentage of framed homes will be destroyed, with total roof failure and wall collapse. Fallen trees and power poles will isolate residential areas. Power outages will last for weeks to possibly months. Most of the area will be uninhabitable for weeks or months. 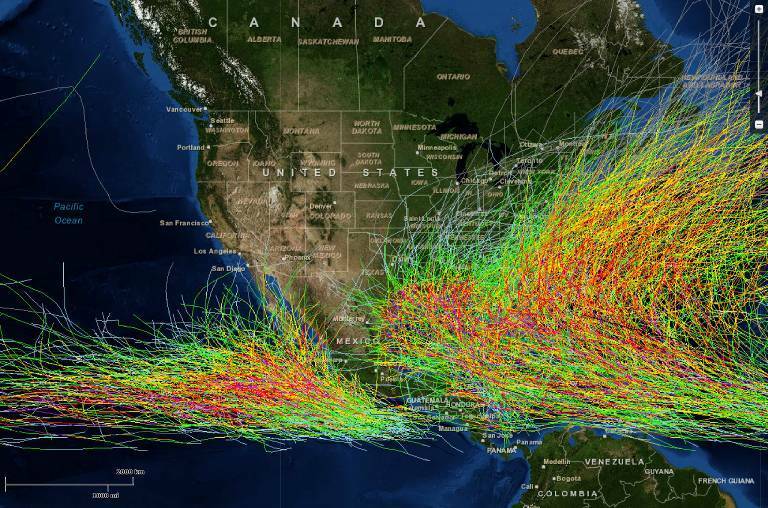 This map shows the track of all tropical storms and hurricanes on the Atlantic and Pacific basins of the U.S. since 1842. 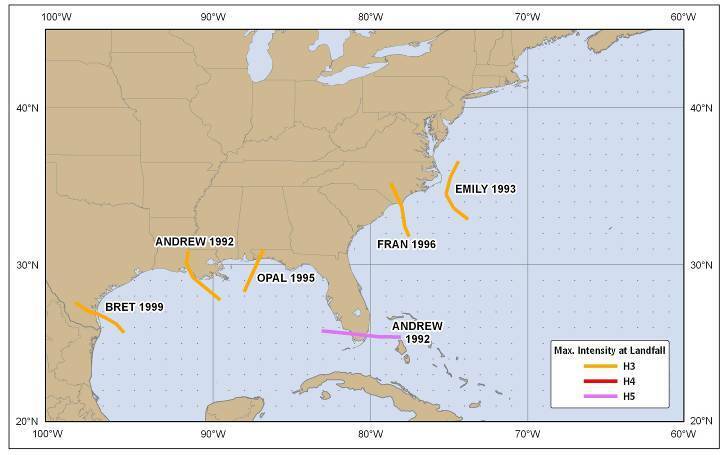 Paths of some major landfall hurricanes from 1991-2000. 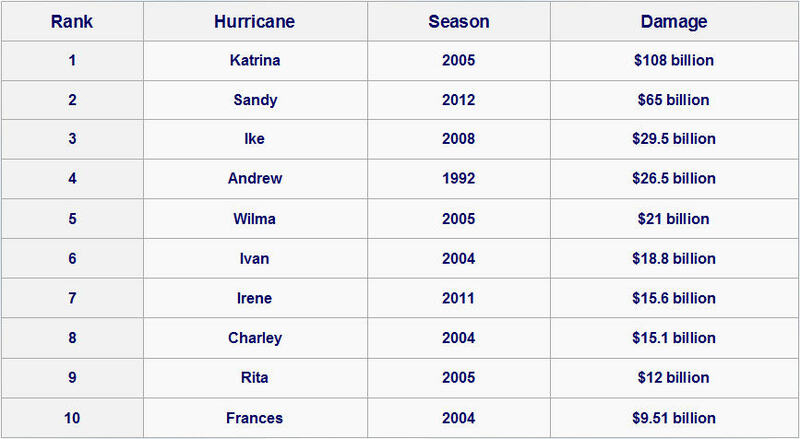 This chart list the top 10 costliest hurricanes as of end of hurricane season 2012. Wind borne debris – Airborne projectiles that cause glass breakage and other damage to buildings during severe wind events. This is one of the major causes of damage during a hurricane. This is the one we will focus on that hurricane resistant windows and doors can mitigate. •ASCE 7 is referenced in major U.S. model building codes. 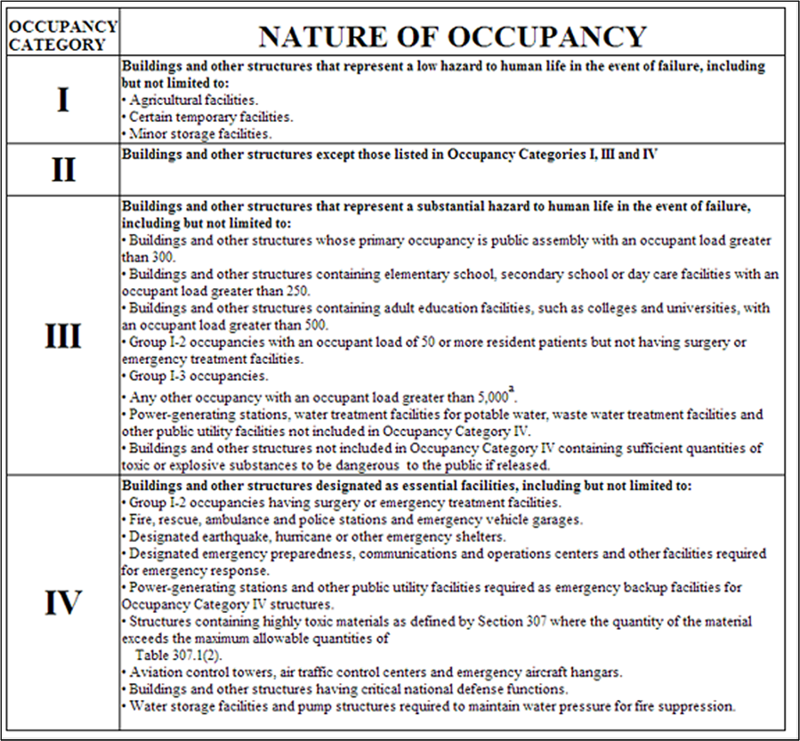 • The international codes contain specific requirements for hurricane regions (IBC, 2000; IRC, 2000). • Windborne debris requirements are significant new factors in model building codes. • ASTM E1886/1996 are national consensus test method and specifications for windborne debris impacts in hurricanes (ASTM,2002; ASTM,2002a). The consequences of broken windows is that they will let a huge amount of water and strong winds into your house. Wind forces on window assemblies: Three common problems in older homes are that the glass is not mounted into its sash well enough to resist wind pressure, that the sash doesn’t stay in, and that window frames are frequently not well enough attached to the house to withstand very strong winds. A 50 mph wind only pushes on a window or door with about 5 to 7 pounds of force per square foot of area, whereas a 100 mph wind applies 20 to 28 pounds per square foot, and a 130 mph wind applies 34 to 47 pounds per square foot. These forces are applied on every square foot of a window. This means that a bedroom window that is say 3′ wide by 5′ long, when subjected to a 100 mph wind, has between 300 to 420 pounds of force applied to the window and the frame. Think about having 2 men or 3 women sitting on the window. Windows and doors that have been tested and rated for high levels of water resistance will perform better and allow less or no water into the structure. Hurricane prone regions: Areas vulnerable to hurricanes (basic wind speed greater than 115 mph). 2. in areas where the basic wind speed is equal to or greater than 140 mph. Glazing, impact resistant: Glazing which has been shown by an approved test method to withstand the impact of windborne missiles likely to be generated in wind borne debris regions during design winds. Impact resistant covering: a covering designed to protect glazing, which has been shown by an approved test method acceptable to the authority having jurisdiction to withstand the impact of wind borne missiles likely to be generated in wind borne debris regions during design winds. 2. Glazing located over 60 ft above ground and over 30 ft above aggregate surface roof debris located within 1500 ft of the building shall be permitted to be unprotected. 3. “Either/or principle” is employed. • ASCE-7 to calculate a project’s “Design Pressure”. Current version is ASCE7-10 Major changes from previous version. The outcome of these changes are that design velocity pressures are reduced in some hurricane prone regions while design velocity pressures remain largely unchanged in non-hurricane prone regions. All previous versions of ASCE 7-10 were based on calculating design pressures using allowable stress design (ASD). ASCE 7-10 is the first edition of the standard to be based on ultimate strength design (USD). While the wind speeds in the newer maps are much higher than those in previous editions, the load factor on wind (W) in Section 1605.2 is now 1.0 instead of 1.6 for the strength load combination, as established in the 2007 FBC. Likewise, the load factor on wind (W) in section 1605.3 is now 0.6 instead of 1.0 for the allowable stress load combinations. Therefore the actual design pressures are comparable even though the wind speeds are much higher. • Hawaii, Puerto Rico, Guam, Virgin Islands, and American Samoa. 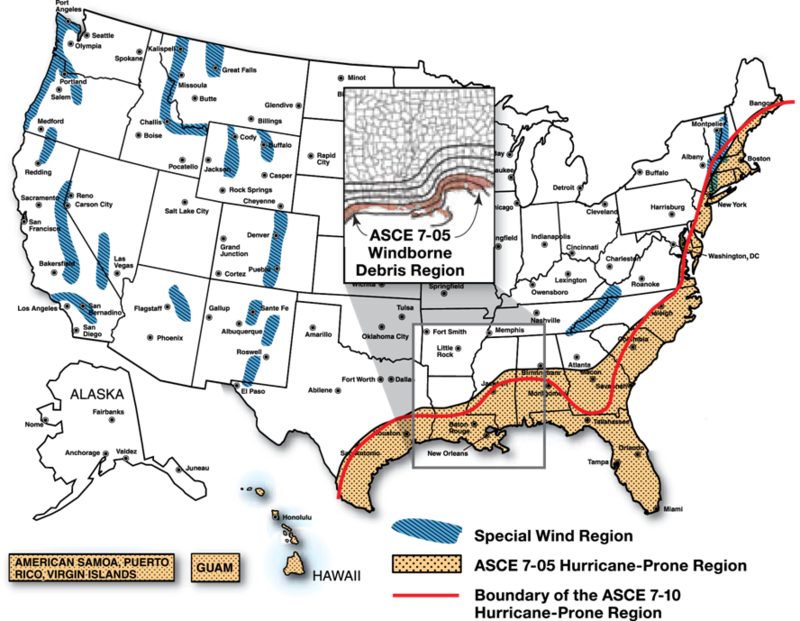 • Those areas within the Hurricane Prone Regions located within 1-mile of the coastal mean high water line where the basic wind speed is equal to or greater than 130 mph and Hawaii. • In areas where the basic wind speed is equal to or greater than 140mph. Larger missiles tended to fly and tumble within 30 feet of the ground while small missiles fly at heights up to 30 feet above small missile sources. Large missiles such as roof tile, concrete blocks, timbers, sheet metal, and fascia are common. The 2×4 timber was determined to be representative of objects that commonly fly in hurricanes and was found to be easily propelled from an air cannon in a repeatable manner. Several different masses of 2×4 timbers have been defined for design use. Small missiles tend to fly at greater heights than large missiles. The most common small missile is roof gravel, but broken glass particles, bits of roofing material and small chips of concrete and clay tile also have been observed. A 2 gm steel ball is representative of small missiles that fly in windstorms. Both large and small missiles were analyzed in sustained wind conditions to ascertain speed and flight trajectory information. Large missiles injected into the wind stream at an elevation of 30 ft were determined to attain a speed that is 1/3 to 1/2 of the wind stream velocity before hitting an adjacent building object or the ground. Hence, sustained wind stream velocities of approximately 100 mph accelerate these missiles to 33-50 mph. Based on these analyses, impact speeds for large missiles were set at 40-80 ft/sec. Small missiles are injected into the wind stream at greater heights, e.g., from rooftops. Hence, they tend to remain in the wind stream longer before hitting an adjacent building or the ground. Speeds up to 90 percent of the wind stream velocity were calculated for the 2 gm steel ball. The impact speed for the small missile was set at 130 ft/sec. • Large missile represents debris that moves close to ground. • Small missile represents debris that moves at high elevations. 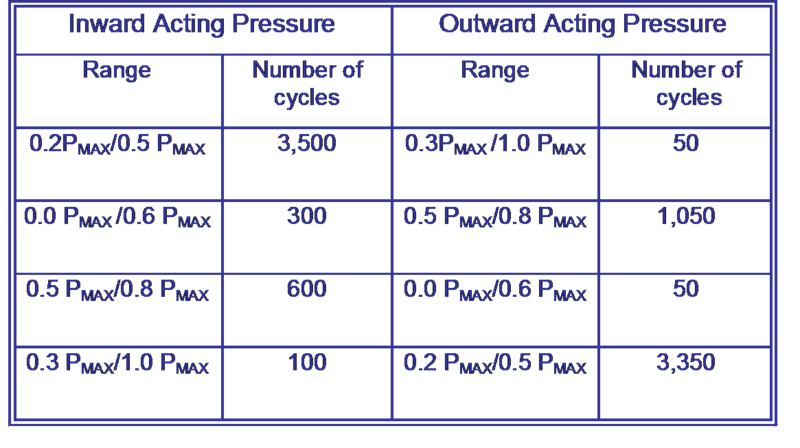 • Pressure spectrum represents inward and outward acting, fluctuating pressures. • ASTM E1886-02 is a test method only. 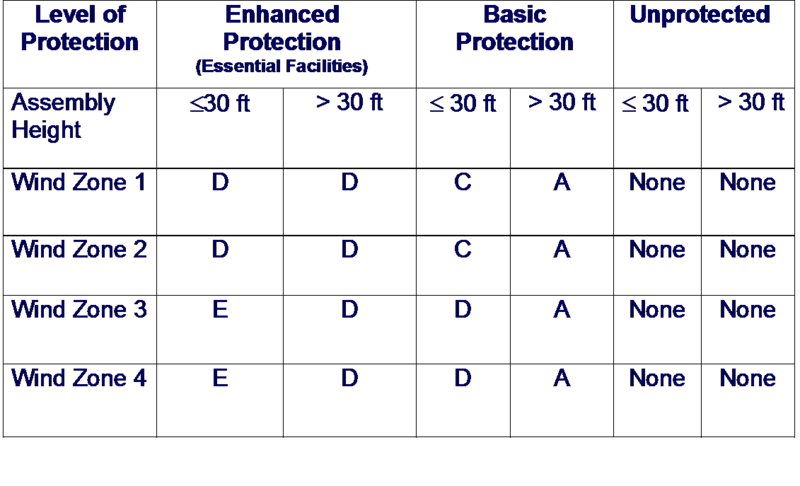 • Specific impact requirements are defined in specification ASTM E1996-02. A product is large-missile resistant after it has been exposed to various impacts with a piece of lumber weighing approximately 9 pounds, measuring 2″ x 4″ x 6’ (no more than 8′) in size, traveling at a speed of 50 feet per second (34 mph). Then the product must pass positive and negative wind loads for 9,000 cycles, with impact creating no hole larger than 1/16 x 5″ in the interlayer of the glass. A product is small-missile resistant after it has been exposed to various impacts with 10 ball bearings traveling at a speed of 80 feet per second (50 mph). The product is then subjected to wind loads for 9,000 cycles. •ASTM E1886-02 is a test method only. •Specific impact requirements are defined in specification ASTM E1996-02. • Impact products offers 24 hour protection with no action required. • The use of impact resistant windows and doors may also help reduce insurance premiums. • The number of layers of each sheet of glass and the thickness of each, and the laminate interlayer can be varied in order to achieve the required performance. Impact resistant windows and doors is not just laminated glass. It is an evaluation of the entire system. Don’t forget anchorage. Testing and engineering analysis discussed today is for the entire opening not just the glazing. 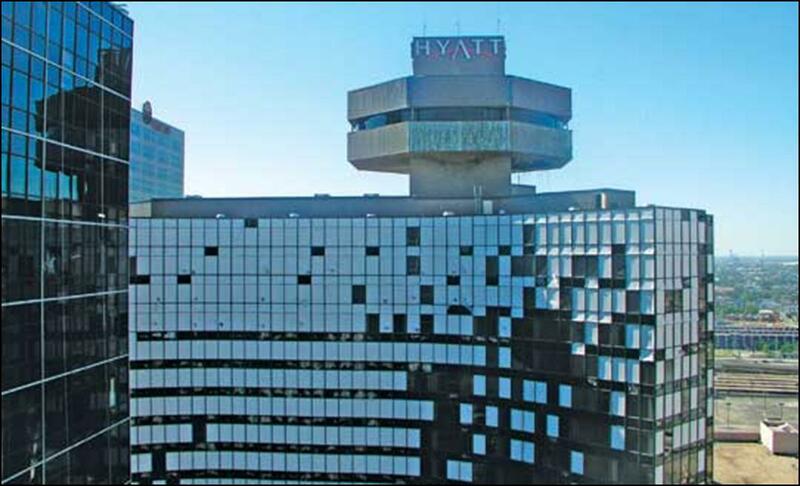 • When specifying impact resistant glazing systems, it is important to look for a manufacturer who is a member of and certifies their product to AAMA. • AAMA membership and certification helps to ensure quality performance and consistency in manufacturing. AAMA offers a independent certification program for window and doors. This certification program assures you are getting a quality product that has been tested and evaluated to stringent industry standards.